HENRY VIII, obviously the eighth king of England to bear the name of Henry, was a robust 33-year-old in 1524. He had already excelled in many areas, had acquired a number of accolades, and could easily have felt that the world was at his feet. In fact, much of his surrounding world seemed to act as if it were lying at his feet. With his impressive size, his impressive clothes, his impressive pomp and ceremony, his Renaissance education and his unflagging self-confidence, he appeared larger than life to most of his subjects, and was seen as a major force to be reckoned with in the European balance of power. He was at least what our age would call “an achiever, ” probably even “an over-achiever. ” He could play multiple musical instruments, dance, hunt game, lead an army, win at a joust, control his nobles and spend money like it grew on trees. Whatever constituted the stage, Henry VIII dominated it. Even theology was not beyond the exertions of this highly confident King. When Martin Luther questioned the reigning theology of the period, with its minimal piety and its idolatry of popes, priests, saints and symbols, Henry considered himself quite capable of rebutting the troublesome Saxon monk, and soon produced his Defense of the Seven Sacraments. This appeared in 1520, about one year after Luther’s writings began to achieve really-wide circulation, and was almost entirely Henry’s work. For a while at least, it was the predominant theological apologetic in England for the traditional Catholic faith. Although today, post-Reformation, we might question the Defenses’s effectiveness in combatting “the Lutheran heresy, ” the pope at the time was apparently impressed with it. At least he was quite effusive in his praise of it (but of course nurturing good relations with kings was always a good political move for the pope). The pope named Henry “Defender of the Faith, ” another plaudit to add to his various other titles of accomplishment. So at age 33, in his prime, Henry VIII had established himself as a powerful, “go-getter ” king, and his kingdom was enjoying a period of relative economic and political stability that had been unknown in recent English history. With his gifts, personality and training, he was leading England out of the Middle Ages and into more-modern, less-tumultous times. One might think his personal life would have reflected this less-tumultous ideal, and in many ways it promised to. He had an adoring wife, Catherine of Aragon, who was a daughter of the most powerful dynasty Spain had ever seen. Their marriage had secured an important diplomatic ally, establishing close family ties between Henry and Emperor Charles V, and had produced one child for the couple, a daughter they named Mary. However, this facade of domestic and political bliss was actually quite shallow, as a closer look at Henry will demonstrate. In many ways, as history records him, Henry was more a picture of the “red-necked ” blue-collar worker who curses at his wife, talks with his mouth full, and stands on the street corner boasting of his sexual exploits. Numerous records exist to show us that he was ostentatious, authoritarian, unpredictable, a bully, a braggart, and certainly not deserving of much trust. He forsook alliances and broke political promises without notice. At various moments he used his royal favors to tease court factions, foreign governments and even religious leaders, then disdained or even attacked these same people the next moment, depending on his royal whim. Unfortunately, it was this darker side that eventually came to dominate Henry’s life, not only destroying his first marriage and wife, but also the several that came after her. However, in 1524, at age 33, Henry was still relatively restrained, probably imagining neither the extremes he would go to nor the trouble he would receive from an obscure English priest who slipped out of his kingdom and headed for the Continent that year. Perhaps later the king wished he would have learned more about this priest before the man left his kingdom, because it was only after leaving England that Tyndale began to cause Henry problems. But Henry did not know, in 1524, about Tyndale’s frustration with the religious ignorance of the priests and abbots who visited Little Sodbury Manor. Nor did he know about Tyndale’s disappointment when the bishop of London, Cuthbert Tunstall, denied the translator permission and help to do what he believed he had to do, no matter what the law said. Tyndale’s request seems harmless enough today: he merely wanted to translate the Bible from its original languages into English. But at that time, a church law established in 1408 was still in effect, and that law said that all translation of the Bible into the vernacular language was absolutely forbidden, except by specific ecclesiastical permission. So Henry did not know, in 1524, that Tyndale was determined that his countrymen would have the Bible in their own language. But Henry would soon clearly come to know that, as he heard about William Tyndale and his vernacular Bible many times in the next 12 years. In the fall of 1525, in Germany, Tyndale saw something that no Englishmen had ever seen before. At Peter Quentel’s shop in Cologne, Tyndale witnessed pages of the New Testament translated from Greek coming off a printing press, the most-modern technology of the day. Not only was the text in English, but the books would be available at a price affordable to the common man. However, informers and anti-reformers interrupted Quentel’s production of the New Testament before it could be completed, so Tyndale and his companion, William Roye, fled Cologne and found another printer—this one in reform-minded Worms—who would reset the text. By early 1526 this printer had produced several thousand copies of the first printed English New Testament. Within the first three months of 1526, complete New Testaments and copies of the Cologne fragments were arriving in England by the hundreds. Most of the religious establishment was outraged, and the government issued proclamations prohibiting the importation—but the dissemination of the books could not be stopped. Probably the first time Henry VIII heard William Tyndale’s name was during the hubbub surrounding the clergy’s attempts to stop the smuggling in and black-market selling of the forbidden translations. the end of 1526, Tyndale had produced a theological introduction to the book of Romans, in which he set forth his understanding of salvation by faith alone. Two years later, from Antwerp, he published The Parable of the Wicked Mammon and The Obedience of a Christian Man. These two works also declared Tyndale’s views on justification, as well as several other areas in which he disputed the Roman Church’s teaching. It had become obvious that Tyndale was the genius behind the translation, that he was a writer of considerable merit, and that he was an articulate theologian committed to the reformation cause. The English crown and the church saw that this man had either to be stopped, or co-opted to join their forces. Meanwhile, despite the official hostility toward Tyndale, his smuggled-in works were finding thousands of avid readers in a nation just awakening to the power of the printed page. this time, Henry’s passion for a male heir to secure the throne had become his personal obsession, and hence, of course, a matter of public concern. After several tries Catherine still had not provided the desired boy-child, and Henry was convinced there must be a larger, metaphysical reason. Of course it was not his fault. And he could always have yet another affair, but the legitimacy of his son had to be beyond challenge. Something was desperately wrong about his marriage to Catherine, he concluded—perhaps it was cursed because, after all, Catherine was the widow of his deceased brother, and marrying your brother’s wife was clearly prohibited in Leviticus 18:16, wasn’t it? He must, he decided, be freed from Catherine if he was ever going to bear a son in wedlock. He needed his first marriage annulled. But getting an annulment required the Church to make a special exception to its law, not normally an easy thing to accomplish. However, for people in high places, with power to wield, such exceptions were frequently made. Henry wanted such an exception, and he would have one. But the pope procrastinated. Henry grew impatient. Furthermore, Henry could not forget that he had a responsibility for the spiritual welfare of his realm. If the pope would not free him from his “Spanish cow, ” he would free himself from papal obedience. He would lead the church in England himself. In fact, he wanted to be free to marry the new attraction at his court, a young French-trained lady named Anne Boleyn. She was naturally enchanting (later Henry would declare she was bewitching! ), and she especially worked to enchant the king. But despite her enticements, she refused to be his mistress. He must marry her first. Henry, not one to be concerned with the details, leaned heavily in this matter on his friend and long-time advisor, Cardinal Thomas Wolsey. Wolsey was a competent and efficient administrator, who somehow served simultaneously both as Henry’s Lord Chancellor and the pope’s special representative to England! Wolsey was vain and insensitive, but Henry found him useful. However, Wolsey’s limitations soon showed up; he was unable to secure the king’s desires quickly enough. Wolsey, like others before and after him, felt the king’s wrath. Henry would have his way, no matter who it hurt. Once England’s separation from Rome became a reality, then separation from Catherine was easy. Although there were some in England who rejoiced to see this king distance himself from the pope, there were many others who were horrified by these events. The king and his advisors concluded that such conservatives needed to be persuaded. Tyndale could be a powerful addition to the king’s propaganda machine, thought Henry. Someone must find Tyndale and offer him safe conduct to return to England. These efforts were chiefly carried out by Thomas Cromwell and his agent in Antwerp, Stephen Vaughan. But Vaughan’s meetings with Tyndale proved unfruitful. The court had underestimated Tyndale’s character. Love England and freedom as he might, he was not about to surrender his work as a translator, theologian and preacher in order to become merely another nationalistic propagandist. In the meantime, Tyndale had continued translating, writing and publishing, such significant works as an English translation from the Hebrew of the first five books of the Old Testament, his Answer to Sir Thomas More and The Practice of Prelates. From these last two it was obvious that Tyndale could not be bought off or controlled for the king’s selfish purposes. In The Practice of Prelates, Tyndale argued from Scripture that divorce was against God’s will, and specifically dared to assert that the king should stay with his first wife! He also developed a theme introduced in his earlier writings: that the Roman Church and the recent popes, thoroughly corrupted as they were, had successfully manipulated several naive kings, Henry implicitly included, in order to increase their own power. Needless to say, this whole treatise was rather unflattering to Henry, and as was his custom when frustrated, he turned about and began to revile Tyndale. This suited the leading ecclesiastics in England quite well, because they were already reviling Tyndale and the pernicious influence his writings were having on the common people. His works were widely read and heeded—as is evident from royal proclamations dealing with Tyndale as well as from the testimony records of his final trial—and Henry jumped firmly in with those who wanted this influence stopped, no matter what the cost. If Tyndale’s books could not be effectively blocked, and if Tyndale himself could not be co-opted, then he could at least be destroyed, went the king’s thinking. So he changed his tactics. He sent Sir Thomas Elyot to Brussels in 1531, with the overt mission of collecting opinions on the king’s divorce. But Elyot’s secret orders were to find and kidnap William Tyndale. Elyot could not seem to find Tyndale, and after spending more time and money—mostly on “locater ” bribes—than Henry had allocated, the king called him back to London. So Henry’s will was thwarted and Tyndale remained free. Unfazed, he continued his work of writing Bible commentaries and preparing a revision of his New Testament translation. But other searches for Tyndale went on. Finally, in 1535, Tyndale’s place of residence in Antwerp was discovered by English informers, and he was betrayed. By May of that year, he was in the prison in Vilvoorde. And while there is no evidence to indicate that Henry was the culpable authority, it is definitely evident that he did nothing to secure the translator’s release. Yet even while Tyndale was shivering in his cold stone prison cell, a complete Bible in English, dedicated to King Henry VIII, was circulating freely in their shared homeland. This Bible was published by Miles Coverdale, a collaborator of Tyndale’s, but it consisted in the main of Tyndale’s work. By 1537 at least two other Bible versions had been published, both bearing these words on the title page: “Set forth with the king’s most gracious license. ” These too largely consisted of Tyndale’s work. Others were to follow. What Henry and others had fought so hard to prevent—the Bible in English—eventually was ordered by his royal command. Though Henry would never have admitted it, it was an impressive tribute to the martyred Tyndale. Certainly Tyndale was not the greatest influence in Henry’s life during this period. But he was a prominent one. And especially noteworthy because Henry was not a man easily shaken. Yet Tyndale, the humble priest, with his translation of Scriptures and his forthright exposition of those Scriptures, was the translator who—at least briefly—shook the mighty Henry. Dr. Donald Dean Smeeton is associate dean of the college division at the International Correspondence Institute, a Christian correspondence university based in Brussels, Belgium. He is author of a historically ground-breaking work, Lollard Themes in the Reformation Theology of William Tyndale, published by the Sixteenth Century Studies Conference, and is serving as a consulting theological editor for the Catholic University of America’s forthcoming Tyndale series. 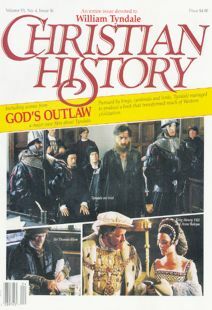 This issue’s Gallery could more aptly be called the Christian History Rogues Gallery. These unhappy tales from the past present good examples not to follow. Personal reflections, in Finney’s own words, about, among other things, his relationship with God, his baptism in the Holy Ghost, Heaven & Hell, perfect peace & blessedness, and his inward struggles with the death of his first wife.